11-nin Iru! won the 21st Shogakukan Manga award in shoujo category in 1976. The manga is included in the English manga anthology Four Shoujo Stories released by VIZ Media in March 1996. It will also be published in Spanish as ¿Quién es el 11º pasajero? by Tomodomo Ediciones in Winter 2016. It was also published in Polish as Było ich jedenaścioro (as part of Mega Manga series) by Japonica Polonica Fantastica in January 2014. The volume contains Zoku 11-nin Iru! : Higashi no Chihei, Nishi no Towa. Just another typical shoujo manga.. no, wait. That was what I thought before reading it. Now I can say that this is one of the most unique shoujo mangas I've read. This fairly unknown and underrated oneshot is on the same level with famous oneshots like Hotel, Island and Omoide Emanon. To me, this is better than any of those. Every self-respecting oneshot-fan should prioritize this manga now. How much can 2 chapters long manga (or any manga in general) offer to its reader anyway ? As much as They were 11 can, I tell you. What happens when there should be 10 people, who don't know each others, in spaceship but there is 11 ? How can they trust each others, how can they found out who is this extra member and what does this all mean ? Thats what this story is all about. Drama, love, mystery, comedy, meaningful message, they are all here. So many characters in this short manga. They all are there on purpose, everyone is unique, likeable and memorable. They are not just drawnings on the paper, they have realistic personality. Their behaviour fits for normal human in the same situation. Art style is also very unique. This manga was made in 1975 and I don't have that much experience about art style back then. I love the way characters are drawn.Their expressions and feelings reach the reader so the author is indeed a talented person. Backgrounds are made with simple and soft lines. I do like it and I would give it a score of 8.5/10. Enjoyment is on the top. I love unique stories and when they are as much success as this, then its impossible for not to enjoy this manga for the fullest. Nearly 40 years ago, the manga industry changed when a bunch of women known as the Forty-Niners (or the Year 24 Group) practically revolutionized shoujo manga. The works of these women incorporated many different sub-genres (including the first BL) and are now considered epic classics. The most famous of them was Hagio Moto, who is one of the most adored and admired mangaka of all time. They Were 11 was created in 1975, and is Hagio's longer one-shots. It's technically labeled 'shoujo', but this manga shows how much they really revolutionized the genre, and why the Year 24 Group is well-known for creating those classics. They Were 11 can really make -anyone- love classic shoujos. And I'll tell you why. It's extremely consistent. It blends the genre between shoujo and shounen, all while having an equal action/character driven plot. Sci-fi, action, fantasy, mystery, and a little spice of romance? It's all in there. They Were 11 is extremely well-rounded; I've read very few mangas as well-rounded as this. Well, it's about a lot of things. After many tests and interviews, a group of 10 people have been chosen to par-take in a final exam. In order for these 10 people to be accepted into the Cosmo Academy (for aerospace piloting), they need to survive on an abandoned space-craft for 53 days without any contact to the outside world. Quite literally the title: They Were 11 even though there was supposed to be 10... There's an impostor on board, and they have no contact to the out-side world. Of course, anxiety does entail and people start to freak out, which only makes more problems come. And that's pretty much the premise of it. There are many characters in this manga, each with a creative, expressive personality. There isn't a lot of development in this manga (since it's only a one-shot), but revelations occur as they search for the 11th person, and we keep learning more and more about the different people. And when these revelations occur, they all stay true to their human-like personality, even if some of them aren't necessarily 'human'. You really can't help but love some of them. And Hagio is pretty brilliant when it comes to the pacing, narration and atmosphere. It can be nail-biting tense, and yet, still have these sweet, soft, romantic moments. As I've said before, it's very consistent too; it manages to fit so much dialogue and text into a single page. And for it's time, They Were 11 does a much better job with it's narration compared to other sci-fi's from the 70's (aka: Terra E... by Takemiya Keiko, another Forty-Niner). The art, too, is obviousy old, but it's made around Hagio's prime. Rather than using a contrast between hard/soft lines to envoke feeling in the reader (a very 70's thing, aka. Terra E...), it rather uses it's plot effectively, and she just draws as she does. Compared to other art around that time, it's very unique. Bottom line, this is the manga that can make any shoujo-hater (or anyone who hates the oldies) adore. In fact, anyone can come to love it because (as I've said before) it appeals to every genre. You need to read this ASAP. Without a doubt, it's a 9.0 / 10.0. The only reason why it's not rated higher was because I felt at some points that it may be better as a short series, rather than a one-shot. However, at other times, the tension was perfect, and I couldn't see it working any other way. Regardless, this is a must read for anyone. 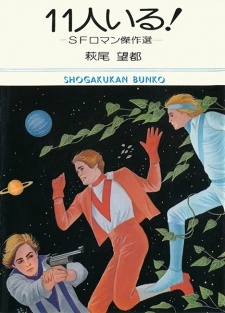 While Moto Hagio is usually considered one of the godmothers of BL it can't be ignored how much she pushed what science fiction was in manga back in the day. Heavily inspired by Ursula K. Leguin this manga touches some romance elements just as an excuse to present how life could be different in other worlds and propose a very interesting setting just for the joy of it (instead of trying to cash in with sequels and expanded universes). While the art my require a little patience for those not used to the classic shojo look it really should be considered by any science fiction fan who likes to focus on the human aspect over the flashy lights and technology.